STATE COLLEGE, Pa. – There is a reason the Penn State volleyball team is the two-time defending National Champion. Junior Jovanna Radojevic and redshirt freshman Jasmine Waters go up for a block against Penn State’s All-American Megan Hodge, who had 11 kills in Friday’s game. The No. 1-ranked Nittany Lions showed their dominance, not once but twice, as the Owls dropped a home-and-home series over the weekend to them. Friday, Sept. 18’s contest saw a record-setting crowd of 2,719 fans at McGonigle Hall, but those fans also saw a national powerhouse prove why it has back-to-back NCAA Championships. In Philadelphia, junior outside hitter Yun Yi Zhang continued to lead the offense with 11 kills. But on the other side of the net, Penn State’s Arielle Wilson, Blair Brown and three-time All- American Megan Hodge all had 11 kills as well. The Lions finished off the Owls in straight sets: 25-13, 25-9 and 25-15. Immediately after the game, both teams boarded buses and made the trek to Happy Valley to do it all over again. Early on Saturday, the Owls played a neutral match against the Red Flash of Saint Francis, who the Owls handled easily, sweeping them 25-18, 25-13 and 25-16. Senior captain Jackie Morrison had 33 assists setting up junior Jessica Antosz, who plugged the middle and added six kills to go with Zhang’s 15 kills. Coach Bob Bertucci said he was happy with the effort against Saint Francis, but as soon as the team downed the Red Flash, he said he was looking for new ways to surprise the No. 1 team in the nation. Junior outside hitter Jovana Radojevic was in the same mind-set. The team did play and block better against Penn State, but the result wasn’t any different, as the Nittany Lions extended their record-setting winning streak to 76 games. 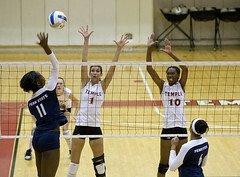 They defeated the Owls 25-16, 25-13 and 25-12. The Owls came out strong and kept pace with Penn State early. Sophomore outside hitter/setter Elizabeth Prang went into the stands early to save a point and to keep a Temple rally going. Freshman outside hitter Danielle Carrozza started and saw consistent action off the bench, helping out with a couple digs. She also faced off against Penn State’s Hodge. Along with Alisha Glass’ 40 assists, Hodge had 24 kills in the match. Hodge was impressed with Zhang’s play, though, as her 14 kills had Hodge telling teammates mid-game to watch her. “She’s got a cannon,” Hodge said. 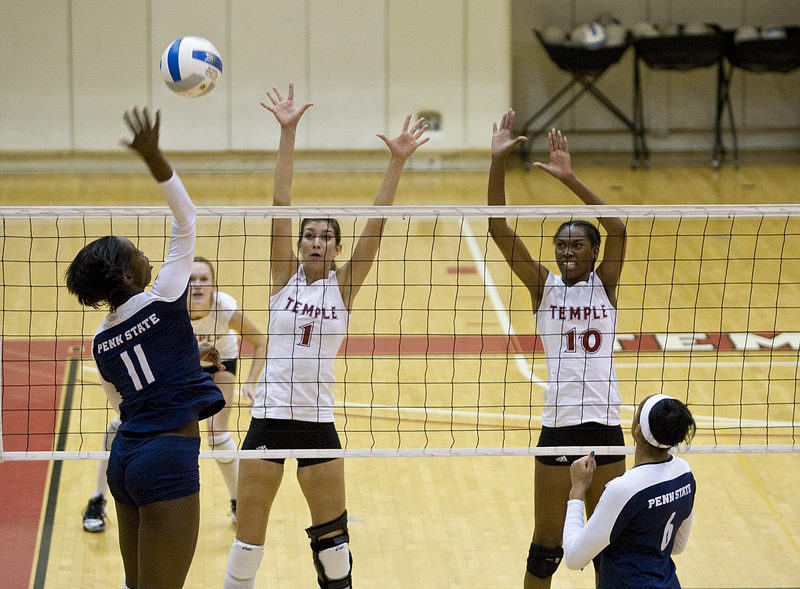 Still, those 14 kills could not help the Owls attain victory. Bertucci was on his feet most of the game and knew exactly what was wrong afterward. With Penn State in the rearview mirror, Atlantic Ten play is now on the horizon. The Owls start conference play with Charlotte at home Friday, Sept. 25.